Den 9 december 2014 kom PhD Silvia Kunitz, gästforskare i svenska/nordiska språk vid Institutionen för svenska och flerspråkighet, Stockholms universitet, till Institutionen för språkdidaktik för att föreläsa om "Multipart oral exams of Italian as a foreign language: A conversation analytic perspective". Silvia Kunitz completed her PhD at the University of Illinois at Urbana-Champaign in 2013. She currently works as a post-doctoral fellow at Stockholm University, in the Department of Swedish Language and Multilingualism within the field of Second Language Studies. 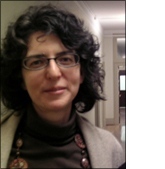 In her research Silvia Kunitz uses Conversation Analysis (including multimodal interaction analysis) to investigate how language learning environments are organized and how students and teachers do learning/teaching in interaction. So far she has been working on the study of group work, of oral assessments, and of computer-mediated teaching. Being a language teacher at heart, Silvia Kunitz is interested in the applicability of conversation analytic findings to enhance classroom interaction and the reflective practices of students and teachers.